Moments that define our lives often come unexpectedly. Sometimes as the moment unfold before our eyes, we don’t fully grasp the long-term ramifications. Such events define us and continue to re-define us as we mature in our Christian walk. On many different levels, 1992 was a year of defining moments for me. Some defining moments are relatively common—and expected. For instance, these were expected of me due to my upbringing: graduate high school, attend college. Perhaps more uncommon life altering moments are those that weren’t on my expected trajectory: encountering the Lord Jesus Christ; reading the Bible for the first time; and shortly thereafter surrendering my life to the Lordship of Christ (unquestionably the greatest defining moment of my life!). These common and uncommon defining moments all occurred during the course of 1992. One other defining moment occurred playing college football. I’d like to share this with you. As a seventeen year old freshman, I pursued my dream to play college football. This rugged sport was my passion. From the age of seven, I played tackle football each fall for ten years. Some of my best childhood memories revolve around football. The moment my parents dropped me off in front of Wright Hall for two-a-days on August 14, I was ready to get to work. Determination pushed me to earn a spot on the football team—and to somehow contribute as a freshman. Prior to my arrival on campus I trained relentlessly. I vividly recall pushing my limits as I’d whisper to myself, “There’s another freshman out there who’s training harder than you right now!” I was in the best shape of my life. The transition to college, life away from home wasn’t difficult. I was focused on the task at hand. I went to work. I made the team, and contributed. Off the field, significant changes marked me as I grew in my newfound faith in Christ. My penchant for vulgar cursing subsided within a week or two. Multiple campus bible studies and fellowship groups became sources of spiritual nourishment. Constantly I made new friends on campus. It was an exciting time for me at Bridgewater College. As a new believer, God’s favor was evident. Football was still a mainstay. There were days I was bone tired after practice. Yet once I stepped on the practice field the following day, I gave it my all—nothing less. The coaching staff gave weekly awards to three categories: an offensive, defensive, and freshman player of the week. A photo adorned the wall of each awarded player. As players streamed into the locker room Monday afternoon, the photo was visible for all to see. Imagine my surprise when I first saw my photo on the wall after an early season game. Fellow players congratulated me. The coaches selected me as freshman of the week six times out of ten games (though one game in which we were demolished, no awards were given that week). Each week I hustled to push my teammates to the next level in practice. There was one moment on the gridiron that outweighed all the other football moments. It wasn’t the awards—those faded. It wasn’t the concussion due to a brutal collision the last game against Davidson College. Due to amnesia I have no recollection of that day. Nor was it the bench clearing brawl in the same game (Mom said I was in the thick of the tussle, but I can’t affirm or deny that claim due to the amnesia). The defining moment involved a name change. And it transpired shortly after surrendering my life to the Lordship of Christ on September 20, 1992. It was an early fall practice. The weather was still warm as we labored through in preparation for our opponent. At this juncture in practice, we were conducting a drill for the kickoff team. At the sound of the whistle, a player sprinted twenty yards towards a lumbering blocker with a ball carrier five yards behind him. The goal: tackle the ball carrier at all cost. Some players succeeded with a congratulatory whoop from teammates; others missed, or were blocked, and chastised by a coach. Those on the kickoff team had to possess one prerequisite: fearlessness, mingled with a bit of madness. I eyed the opposite side to see who I’d face. The starting defensive tackle stepped up as the blocker. A defensive back stood behind him gripping the football. Finally it was my turn. My plan was simple: Hit the blocker as hard as I could and tackle the ball carrier. One thought coursed through every fiber of my body—smash mouth football. With approximately 80 set of eyes—between the players, coaches, and trainers—glued to the action on the practice field, the unexpected transpired. Adrenaline kicked in. The whistle blew. I lunged forward full speed. Like an arrow released by a skilled archer towards its target, I went straight at the blocker. At the point of impact the defensive tackle flew back. I continued forward momentum as I tackled the ball carrier. The teammate’s voice belonged to the starting strong safety, Chad Kumper. Our lockers were side by side. Chad coined the name, just weeks before. Keep in mind, this was the heyday of the early Terminator movies starring Arnold Schwarzenegger. Yet, initially the nickname didn’t gain any momentum. The next day during warmups, the head coach stood over me as I stretched. He was a tall, imposing figure—a man’s whose respect had to be attained the old fashioned way: earned. It stuck. And for me it became a defining moment. The collision had ripple effects beyond the gridiron. Instantly the name took on a life of its own. 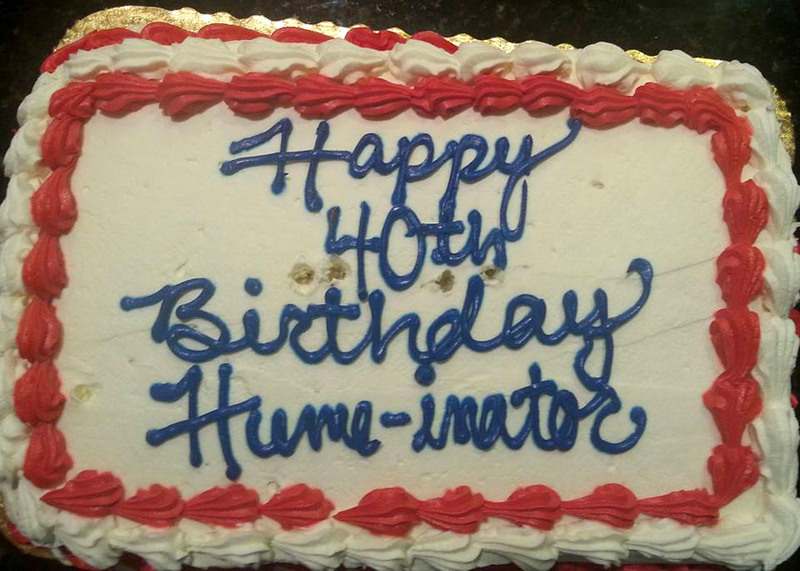 My teammates all called me Hume-inator whether on the field or passing on the sidewalk, in the locker room or the dormitory. And there was a certain measure of respect associated with the name. Even my family took note. A few months later my parents gave me one of the best Christmas gifts I’d ever received—personalized Virginia license plates for my silver Dodge Shadow: HUMEN8R.